5.7GHz transverter, 3W output <1.3 dBNF, Separate TX/RX. Assembled in enclosure. 5.7GHz transverter, 10mW output <3.5 dBNF, Separate TX/RX. Assembled in enclosure. 5.7GHz transverter,10mW output <3.5 dBNF, Separate TX/RX. Transverter PC Board Kit. 5.7GHz transverter, 10mW output <3.5 dBNF, Separate TX/RX. Complete Kit with enclosure. 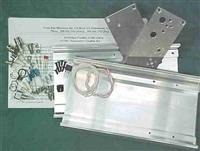 5.7GHz transverter Hard ware kit only. For LP Version Only. 5.7GHz transverter, 10mW output <3.5 dBNF, Separate TX/RX. PC Board Kit. To convert 2M IF transverter to 28MHz IF. Fully Assembled 5.7GHz LNA >14dBG, <0.7dBNF. Assembled. 5.7GHz LNA >14dBG, <0.7dBNF. Complete Kit.